As one path ends, so does another appear for the willing student. You may have come to a point where you wish to integrate new knowledge to your Yoga practice, offer a new range of healing classes, or perhaps use new methods to care for yourself through yoga. To address all of these, and more, Urban Bliss offers a 300-Hour Yoga Teacher Training. You will personally be guided by our founder, Lizzy Hoffman, in Yogic methods of therapy in order to heal the mind, body, and spirit. At the 300-hour Yoga Teacher Training, students will experience like never before the transformative, curative powers of Yoga in a comprehensive, 12 weekend-long course. As with our 200-Hour Yoga Teacher Training, tuition includes study materials and access to online Urban Bliss Yoga videos and lectures. We urge you to register as soon as possible, as students who have early access to their materials do much better throughout their training. 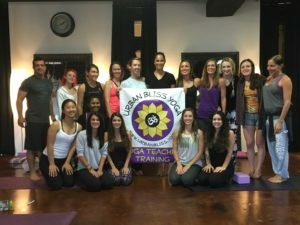 If you are called to expand your Yoga knowledge and bring healing to an even greater number of students, Urban Bliss’ 300-Hour Yoga Teacher Training will help you accomplish this. These trainings are held in select cities, so delay no further and begin the next phase of your journey!